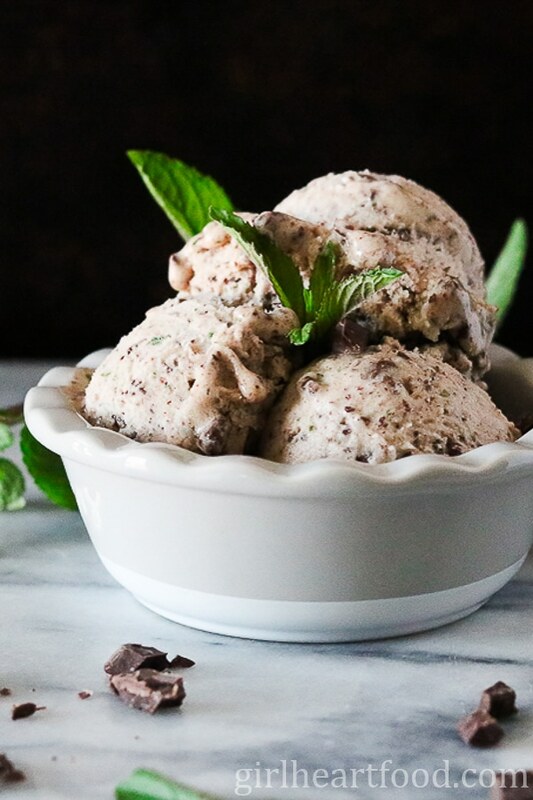 This Mint Chocolate Chip Banana Ice Cream couldn’t be easier! It’s basically frozen bananas that are blitzed in a food processor until they’re super creamy. Then maple syrup, fresh mint leaves, dark chocolate and a touch of mint extract is added to the mix. It makes for the perfect guilt free snack! Hi everyone! How’s it going? What a lovely week hubby and I had! We had a little staycation vacation and the weather was FABULOUS! Like, the best summer we’ve had in years. We were tourists in our own province, doing lots of sightseeing and checking out tons of restaurants. Stayed tuned for my next monthly favourites for some gorgeous shots. And super exciting news is that just last week I was featured on Food Bloggers of Canada! There’s a little Q & A so check it out if you wanna know a little more about me! Have you ever heard of ‘nice cream’ or ‘banana ice cream’? Apparently, it’s all the rage now and all the cool kids are eating it. I actually don’t know if that’s true, but we’re gonna pretend that they are. But, honestly, do we even care? Anywho, I am LOVIN’ this Mint Chocolate Nice Cream. I can get my ice cream fix without having to indulge in a bazillion calories, which totally works for me cause I reeeeeeally don’t want to have to work out extra in the summer. If I’m being truthful, I probably don’t want to work out anytime, but a girl’s gotta do what a girl’s gotta do. There’s only so much I can eat before I can’t fit into dem pants, feel me? Place frozen bananas (cut into chunks) in a food processor and blend, stopping to scrape sides of blender as necessary. It will be crumbly at first, but will blend into a nice creamy consistency. If you are making mint chocolate banana ice cream (like I did here), after bananas are blended add maple syrup, mint leaves, chocolate and mint extract and blend again. Enjoy now as a soft serve or freeze for a few hours for a firmer ice-cream (what I recommend). How to Make Banana Ice-Cream Soft? So, if you go the route whereas you freeze for a firmer ice-cream, it will harden (like ice cream would). To soften and make sure it’s nice and scoopable, leave on the counter for 5-10 minutes before digging it. How Long Does It Take to Freeze Bananas for Ice Cream? How Long Will Bananas Last in the Freezer? I get it, you want this banana ice cream NOW and you don’t have frozen bananas. I highly recommend frozen bananas and do not recommend using fresh bananas. Frozen bananas is what makes this banana ice cream super creamy. It takes a few hours to freeze bananas for ice cream. Ensure that the bananas are peeled and place on a wax paper lined baking sheet so they don’t clump together when freezing. After frozen, if you are not using the bananas right away, store in a freezer bag until ready to use. I recommend using within a couple months. Does Banana Ice Cream Taste Good? Um, YES! Every time I make banana ice cream it always amazes me how creamy dreamy and ice-cream like it is. I practically never buy regular ice cream lately. It’s a great dairy free and healthier alternative to regular ice cream. Like mentioned above, use FROZEN bananas. For banana ice cream, you want bananas that are ripe, but not too ripe. The more ripe they are, the more ‘banana-ey’ your banana ice cream will be (not a bad thing, but just a head’s up). Depending on how powerful your processor is, the time will vary to blend into a creamy consistency (but should take no more than a few minutes). If you want to make things a little easier on your processor, add the tiniest bit of almond milk or milk (if not vegan) to the frozen bananas when blending (start with a couple tablespoons). Don’t overblend or it will become too soft. Did you make it too soft? No worries! Pour into a freezer safe container and freeze for a few hours. I used fresh mint from out garden here. It’s thriving so well. I mean, I’ll never use it all before the season ends. Of course with all that mint lying around, I opted to use actual fresh mint in this nice cream with just a touch of mint extract to really bump it up. If you don’t want to use fresh mint or can’t access, feel free to use just mint extract. I would recommend starting with a 3/4 tsp and taste accordingly. Remember, you can always add more, but you can’t take out. What’s your favourite ice-cream flavour? Hands down it’s mint chocolate chip for me, but close is chocolate chip cookie dough and strawberry. But, really, can you go wrong with any flavour?? Hope you love this easy mint chocolate chip banana ice cream recipe as much as we do! This Mint Chocolate Nice Cream couldn't be easier! It's basically frozen bananas that are blitzed in a food processor until they're super creamy. Then maple syrup, fresh mint leaves, dark chocolate and a touch of mint extract is added to the mix. It makes for the perfect guilt free snack! Place bananas in food processor and blitz for a minute or two. Bananas will look a bit crumbly. Stop processor and scrape side and continue again for a minute or two until smooth and creamy. Add remainder of ingredients and blitz a minute or two until ingredients are combined. 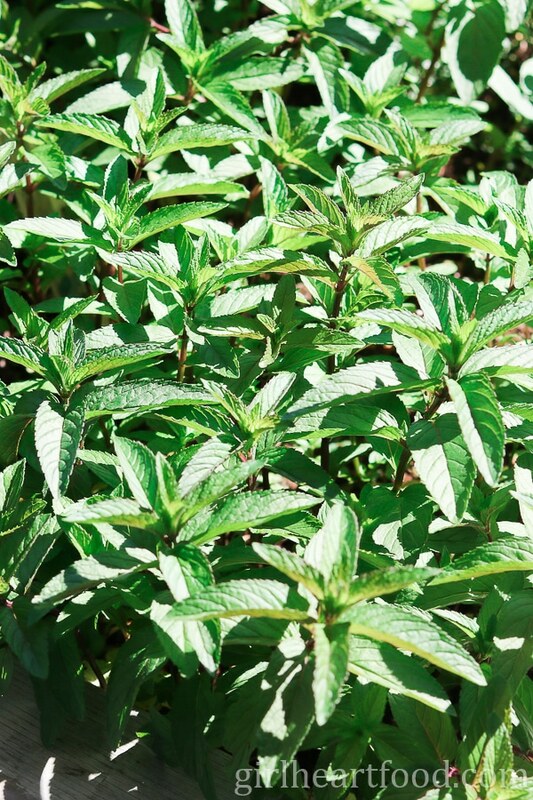 If you want more mint flavour, add a little mint extract at a time. Remember, too much will make it bitter. Enjoy as a soft serve or freeze for firmer ice cream (preferred). 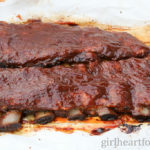 Pour into a pan (I used a standard sized bread pan lined with wax paper (or use a freezer safe tub)). Freeze 3-4 hours. Enjoy! For banana ice cream, you want bananas that are ripe, but not too ripe. The more ripe they are, the more 'banana-ey' your banana ice cream will be (not a bad thing, but just a head's up). Don't overblend or it will become too soft. Did you make it too soft? No worries! Pour into a freezer safe container and freeze for a few hours. I used fresh mint from out garden here. It's thriving so well. I mean, I'll never use it all before the season ends. Of course with all that mint lying around, I opted to use actual fresh mint in this nice cream with just a touch of mint extract to really bump it up. If you don't want to use fresh mint or can't access, feel free to use just mint extract. I would recommend starting with a 3/4 tsp and taste accordingly. Remember, you can always add more, but you can't take out. Wow! This looks really delicious. I am not a fan of mint but I am interested to try this. Will try to make this next weekend. This is the healthiest-sounding ice cream that still sounds kid-friendly at the same time…I’m not sure how your brain came-up with this creation, but I’m not complaining. I’ll let you know whether my kids are able to tell the difference – with the neutral banana flavors, I honestly don’t think they’ll be able to! I love mint + chocolate, and this healthy version looks delicious. Now I know what to do with those frozen bananas taking up space in my freezer! Haha…well, at least you have it now 😉 Mojitos are definitely another great use for mint 🙂 Thanks David! Whoa is that what it is? (Am I not part of the cool kids??) I see nice cream recipes all the time but oops I kind of just skip them because I don’t know, I like calories? HAHA! This looks so easy. And healthy! And yummy! And wow look at your herb garden 🙂 This year we attempted to grow our own in little pots and thank goodness they’re all still alive (we have a history of killing plants but that story is for another day haha). We love plucking some out and using fresh herbs. Very Ina Garten, eh? Hope you having a great week! 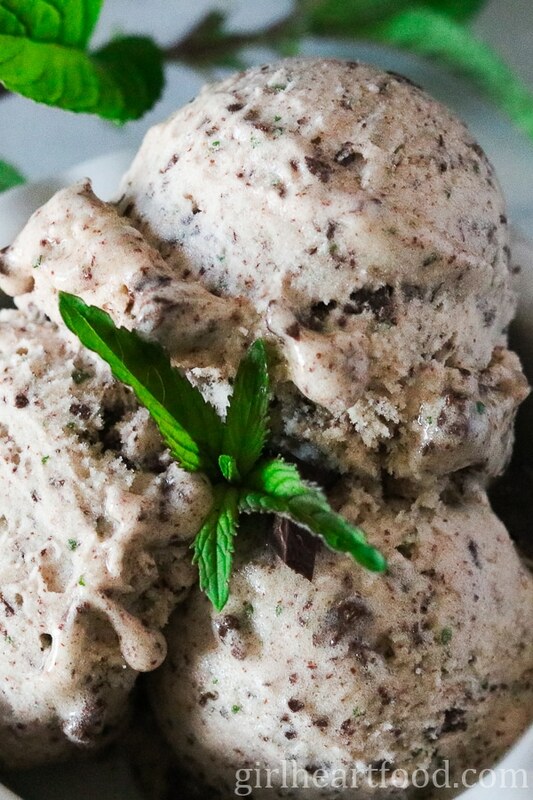 Love this healthy mint ice cream recipe! I’d love to give it a try! i was firmly against nice cream. come on, blended frozen bananas?! and then i had a passionfruit banana nice cream, and now i’m very pro-nice cream (: this one sounds especially tasty and refreshing! also, that q& a was super cool. i know about nothing about newfoundland, so can’t wait to read more about its culture and food! Great minds think alike, because I just shared a recipe for raspberry chocolate chip nice cream today, and had a recipe published for Shape last week for mocha chip nice cream! 😉 I’ve been loving it lately, and I’m always up for the mint + chocolate combo. And yes, extracts are tricky right? Such a tiny bit goes a longgg way! YUUUUM! Nice cream for the win! Love that it’s pretty much guilt free 🙂 Thanks Nicole! Dawn, you win my favourite person of the day award. You win just for coming-up with this recipe which uses pretty much alllll of my favourite things. You rock. Yay 🙂 !! Thanks Amanda! This is all old news to me except for this mint chocolate nice cream! What the? You’ve been holding out on me girl. hahahaha! Chocolate chip mint is my favorite ice cream & I’m on a clean eating plan right now so this recipe is perfect. And that fresh mint! YAY GARDEN!! Welcome back from vacation. Sounds like you lucked out – great weather always seems to help with seeing things differently where you are, and having all that time on your hands to check out new eateries is great! Love your ‘nice’ cream! I always enjoy fresh mint incorporated into desserts and have never been able to grow any successfully. They say mint grows like a weed. Yeah, right. Not for me(:. But I had garlic chives luck this summer:) – figured out that all they wanted was to be in the shade… Lol. I’m pretty sure you’re right that all the cool kids are eating nice cream, which is prob why I haven’t tried it yet :). But I need to remedy that because I looooove mint chip ice cream! Like, LOVE! However, I also love fitting into my clothes. . .So glad you had a great stay-cation. Have a fantastic week! Looks like you had a great staycation! Those are always so much fun. And so is nice cream! I made it the first time about 5 years ago, and I’ve been hooked ever since. I’m loving the flavor of this mint chocolate version. I think I could eat this just about every day, and then some! After all, it’s healthy and has fruit, so it’s my kind of treat! Pinned! Hope you have a great week! We totally did, Gayle! Love this this is so guilt free so I can eat an extra scoop and not mind 🙂 I could eat every day too! Thanks for the lovely comment and Pin and have a great week too! It seems like Nice Cream is all the rage right now Dawn! And this flavors sounds amazing! My son Casey is going to love it and he’s home for one more week before he goes back to school! Can’t wait to make it for him! Have a great week! Thanks Kathy! It’s quite the popular flavour, right? For good reason, I say 😉 Happy you enjoyed the feature! I saw some of your photos on social media and it looked like you and the hubster had a great staycation and birthday celebration!! And I read your interview!! Loved it, congrats sweets!! I happen to LOVE me some nice cream, and boys favorite ice cream is mint chocolate, so this is like a combo of both of us in ice cream form!! Lol. LOVE IT! Pinned! Cheers, girlfriend! We had an awesome vacay!! Thank you so much! It was pretty exciting for me 🙂 Hope both of you love this one! Cheers sweets! I think it IS true that the cool kids are eating nice cream! But yours looks WAY better than the average nice cream. It looks and sounds awesome!! Glad you had a good staycation… those are my favorites! !